In 1860, Louis-Ulysse Chopard established a high-precision watch manufacture in Sonvilier, Switzerland, specializing in pocket watches and chronometers. Chopard watches helped build a reputation of reliability and quality for Swiss-made products. Then, as now, Chopard stands out, meeting the highest standards of quality and precision in the 19th century. Chopard is one of the last family-run watch-making companies, passed within the Chopard family from Louis-Ulysse to his son, Paul, in 1937 and, in turn, grandson Paul Andre in 1943. He had the foresight to relocate Chopard to Geneva, the Haute Horlogerie (fine watch-making capital). Under the guidance of Paul Andre, Chopard became known for its exceptionally accurate watches with high degree of technical sophistication. Twenty years later, In 1963, another family took the helm when Paul-Andre sold to Karl Scheufele III, third-generation member of a watch and jewelry dynasty who, with his wife Karin, developed Chopard in a new way, spearheading an international expansion and enhancing the brand's reputation. 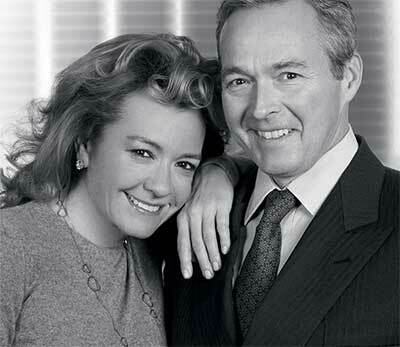 In the 1980s, Caroline Scheufele and Karl-Friedrich Scheufele, Karl and Karin's children, took an active role in the company and today serve as co-presidents. Among the innovations that the Scheufele family brought to Chopard: A new production site was built in Geneva-Meyrin, and the development of watches for ladies (1974); the creation of the first watch with mobile diamonds that spin and slide freely between two transparent sapphire crystals - the Happy Diamonds collection (1976); the launch of an elegant, lightweight, watertight and shock-resistant stainless steel watch, the brainchild of then-22-year-old Karl-Friedrich Scheufele, named the St. Moritz (1980); the brand's first complicated watch, with a perpetual calendar and retrograde display - the Luna D'Oro (1984); a partnership with the Mille Miglia race, an annual vintage car and classic rally held in Italy; the founding of Chopard Manufacture in Fleurier in the Swiss Jura mountains (1996); the affiliation with the Grand Prix de Monaco Historique as Chopard becomes the race's official timekeeper (2002); the opportunity for clients to customize their own Happy Sport collection, in a watch fitted with an automatic movement via a playful app (2013); and a partnership with Porsche Motorsport as the car manufacturer returns to the 24 Horus of LeMans (2014). 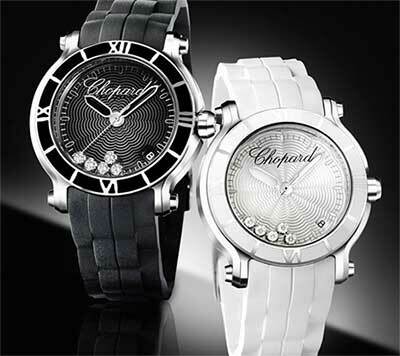 Chopard watch collections for men and women are luxurious and maintain their own characteristics. They are available in platinum, 18K white, yellow and rose gold, titanium and stainless steel, as well as combinations of white and rose gold, rose gold and titanium, rose gold and stainless steel, and platinum and white gold. Classic collection watches have an understated appeal that bridges the past to the present in a noble way. They are suitable for everyday wear. Pick your automatic movement timepiece with a polished or diamond bezel. The three collections under the Classic Racing umbrella show the brand's passion for auto racing, with timepieces that bridge automotive engineering with mechanical watch-making named for world-renowned races, including Mille Miglia, Grand Prix de Monaco Historique (GPMH), and Superfast. They arrive beautifully boxed. Think of them as powerful precision performers. 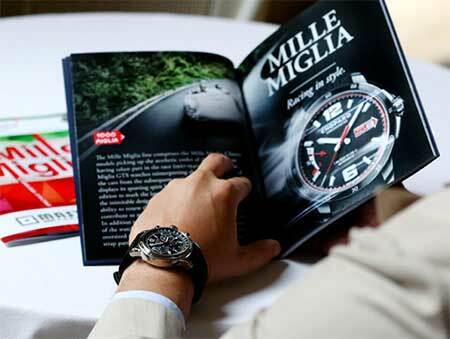 The Mille Miglia is a luxury sports watch. The Grand Prix de Monaco Historique features sports car details on its case, dial markers and pushers. The bold and assertive-looking Superfast, with its case that displays a powerful presence, were the first to be designed, developed and assembled at the Chopard workshop at Fleurier Ebauches. The generously sized surgical steel timepieces are comfortable, legible and built with the attention to detail, fit and finish that are synonymous with the Chopard name. All models are COSC-chronometer-certified (tested in five different positions in extreme temperatures to ensure accuracy to Swiss specifications) and pick up the design codes of the race car, such as dials with brushed lines that resemble air-cooled racing engines' cooling fins; minute numerals on inner bezel rings that recall sports-car rev-counters and speedometers; a smooth tread pattern on natural rubber straps with a think folding clasp; a steering wheel logo on the rubber-molded crown; bezel screws akin to the lugs on car-wheel rims. Happy Diamond timepieces are ones to watch – literally! Dancing diamond, set in 18K gold, provide a sparkling femininity to the watches that are available with quarts or automatic movements, and straps or bracelets. A hidden crown makes pieces timelessly fashionable. Find a 38mm quartz movement style with prong-set floating diamonds, as well as a medium size 37mm case with guilloche dial, and more! The flattering pieces work with jewelry in the Happy Diamonds collection. Happy Sport watches are strong yet delicate, traditional yet innovative. Their style is timeless, with a sporty elegance in which diamonds-in-motion spin freely. The iconic design is available in mini and medium sizes, with 30 and 36mm cases, with a ceramic bezel, and quartz and automatic movements. You can find traditional, as well as light blue Mother-of-Pearl and navy blue dials. The Imperiale collection will wrap your wrist in elegance. The feminine, sculpted, finely detailed timepieces have a lotus-shaped motif that pays tribute to a time of tradition and royalty, inspired by embroidered imperial gowns and royal cushions. Dials and top end are made from delicate semi-precious amethyst gemstones, and Mother-of-Pearl dials are hand-decorated with a pattern. The watch hands are reminiscent of daggers. Find a mini model with 29mm case and automatic movement, or a medium size 36mm style, available with a quartz or automatic movement. All models have Roman numerals that mark the hour. The Jacky Iclx collection was presented in 2003 as a tribute to the six-time winner of the LeMans 24 Hours Endurance Race. The L'Heure du Diamant collection offers exceptional luxury watches with flawless gem-setting. The luxurious evening watch for ladies is dramatic and dazzling, thanks to its classical shape, large prong-set diamond cases and pave dials. Sapphire crystals are scratch-proof, cambered and glare-proofed. Wear one of Chopard's diamond watches with a Happy Diamond pendant, as they complement each other beautifully. The timeless L.U.C. collection was inspired by the brand's founder, Louis-Ulysse Chopard. Four new L.U.C. and four new calibers were presented in celebration of Chopard's 150th anniversary: the All in One, the L.U.C. Louis-Ulysses Tribute, the Engine One and L.U.C. 1937. Chopard has also had numerous honors bestowed and been a part of industry distinctions, like the "Best Training Company Prize" for its long-term commitment to the training and education of its employees, in 2008. This same year, the Fleurier Ebauches, dedicated to producing Chopard mechanical movements, was founded. It should come as no surprise that Chopard should have the last word regarding your watch!